I was asked last August to write an assessment of President Barack Obama’s public health legacy for the January issue of the American Journal of Public Health. My drop-dead deadline was mid-October when the overwhelming consensus indicated a likely electoral victory for Hillary Clinton who would have continued President Obama’s directions. Funny how things can turn so suddenly, as they have with the electoral college victory of Donald Trump and the emergence of a new and conservative federal Administration. Some of my commentary — just released — still seems appropriate, even if a big chunk of Obama’s legacy is repealed. So here’s my official appreciation of what Barack Obama has done for Americans’ health and America’s health care system. (If you look at the AJPH, you will see two companion editorials, one by Drs. Steffie Woolhandler and David Himmelstein critiquing the Obama legacy from the left, and one by Dr. David Sundwall with a critique from the moderate right. Every modern US president since Harry Truman has impacted the nation’s health through his successes and failures.1 Arguably, Lyndon Baines Johnson created the most important legacy through the establishment of Medicare and Medicaid in 1965. Whether Barack Obama’s health achievements equal or exceed those of LBJ is a judgment best left for historians. At this point, it is reasonable to conclude that the Obama public health legacy will be deep, broad, and wide. 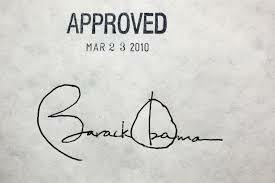 Obama’s landmark achievement, the Affordable Care Act (ACA; Pub L No. 111–148), along with related enactments, assumes outsized significance in the real world and in this commentary. In addition, many other laws, regulations, executive orders, and other actions contribute to a compelling Obama public health record. In this brief overview, I consider the ACA and the President’s other public health accomplishments. Although the ACA, to date, has fallen far short of the public health community’s expectations on many fronts, it is close to the most ambitious health reform law that could have been achieved in the 2009–2010 US Congress, or in any other modern Congress for that matter. Also, the ACA is still only six years old. The 1935 Social Security and 1965 Medicare–Medicaid laws initially fell well short of their respective visions, and only later matured into their current recognizable forms after decades of subsequent improvements. So it is and will be with the ACA, born in a contentious and madly partisan legislative environment, with many improvements still needed to fully realize its ambitious goals. That realization should not denigrate the law’s accomplishments. On access, more than 20 million formerly uninsured Americans have obtained health coverage, and the US rate of uninsurance has dropped to the unprecedented low rate of 8.6%.2 Coverage gains have disproportionately benefitted those most in need, especially lower income, non-White, and younger adult households. The shameful health insurance practices of medical underwriting and preexisting condition exclusions, as well as annual and lifetime benefit limits, have been abolished. Medicaid now makes quality and affordable coverage available to nearly all low-income Americans in the 31 states that have adopted the ACA expansion; over time, the 19 other states will follow. Although the work is far from done, this is extraordinary progress after so many decades of trying and failing. The content of health insurance in all markets has been improved markedly. The ACA’s Title I guarantees that nearly all health insurance policies include 10 essential health benefits including, for example, mental health and addiction services, as well as prescription drugs. Another section requires that all health insurance policies must offer all clinically effective preventive services such as vaccines and cancer screenings that are recommended by the US Preventive Services Task Force, and with no cost sharing. Many millions more than the formerly 20 million uninsured have benefited from the ACA’s access and coverage provisions. On transforming medical care, the ACA has reset the US health system irreversibly on a course away from wasteful and inefficient fee-for-service payment toward value-based models that reward quality, effectiveness, patient centeredness, and population health management. Accountable care organizations, patient centered medical homes, bundled payments, readmission, and hospital-acquired condition penalties—all these and more have become part of the nation’s emerging accountable care and “triple aim” landscape. Implementation of electronic health records has advanced with impressive speed and reach, as more than 80% of nonfederal acute care hospitals have adopted basic electronic health records with clinician notes. Although partisan bickering slows the continuous policy improvement of most ACA provisions, the 2015 Medicare Access and CHIP Reauthorization Act (MACRA), approved by the Republican-controlled House and Senate and signed by President Obama, only expands and deepens the ACA’s direction toward alternative payment models. Yet another ACA landmark is the major expansion of federally qualified community health centers that now serve more than 24 million Americans at 1375 centers in 9200 communities, as well as the National Health Service Corps that provides medical student debt relief in exchange for service in underserved communities. As of 2015, 9600 Corps clinicians were providing primary care services, more that twice the number of 3600 doing so in 2008. Any list of the Obama Administration’s key health gains must include groundbreaking achievements in environmental health protection. The successful negotiation of the Paris Agreement on climate change, formally ratified in October 2016, for the first time has set the global community on a low-carbon course. Additionally, the Obama Administration’s numerous initiatives to limit carbon and other forms of pollution from power plants, cars, trucks, homes, and businesses are changing fundamentally how Americans consume energy, enabling the nation to meet its environmental goals in ways that will save countless lives. For example, the Environmental Protection Agency’s 2013 regulation on “National Ambient Air Quality Standards for Particulate Matter” will prevent thousands of premature deaths of elderly and young children from cardiovascular and respiratory illnesses caused by soot pollution. Regarding nutrition and food policy, the Obama Administration has reformed essential federal nutrition programs that provide a critical safety net for millions of American children and families. Lead by the US Department of Agriculture, for the first time in decades, the most current dietary science is being applied to nutrition programs. More than 50 million children now have healthier food environments at school. Because of new food standards, nearly four million schoolchildren have access to nutritious meals each day in summers, and eight million low-income women, infants, and young children receive improved WIC food packages. Unknown to the public has been massive upgrading and professionalization of emergency response systems in the United States and globally. Two National Health Security Strategy Plans (NHSS), 2010 to 2014 and 2015 to 2018, have galvanized national efforts to minimize the health consequences of large-scale emergencies in response to the deficiencies evidenced by the tragedies of the 9/11 terrorist attacks in 2001 and Hurricane Katrina in 2005, to achieve a “health-secure and resilient nation.”4 The work’s impact can be seen in the US government’s response to national and global health security threats over the past eight years such as the 2009 influenza pandemic (H1N1), Middle East respiratory syndrome (MERS), the West African Ebola epidemic, and the current Zika virus threat. This new infrastructure helped to address health security threats from recent international crises such as the 2010 Haitian earthquake, the 2011 Japanese tsunami and nuclear power plan incident, and the 2013 Philippines typhoon. Space constraints do not permit a thorough presentation of the public health achievements and progress by the Obama Administration. Such a full list would also describe: national and global progress in addressing the HIV-AIDS epidemic; fundamental changes in behavioral health financing and access including progress in addressing the advance of the opioid epidemic; adoption by numerous federal agencies of social determinants of health approaches in housing by the US Department of Housing & Urban Development and in transportation by the US Department of Transportation; major declines in adolescent pregnancy rates; unprecedented attention to the health needs of lesbian, gay, bisexual, transgender, and questioning communities; and much more. Every Presidency leaves a unique record and legacy of accomplishments and shortcomings, of wins and losses. Noteworthy during the Obama years has been the extraordinary number of initiatives, programs, experiments, and demonstrations that move moved the needle toward greater access, quality, equity, effectiveness, and efficiency in important matters relating to health care and public health. Wherever Barack Obama lands in the historic hierarchy of significant and positive contributors to health, the extraordinary efforts made by him personally and by his talented, dedicated, and principled Administration have set a high bar and model for all who follow. The Obama era has been a consequential eight years, and the Administration’s impact has been overwhelmingly for the better for the American people and for the people of the world. 1. D Blumenthal, J Morone. The Heart of Power: Health and Politics in the Oval Office. Berkeley, CA: University of California Press; 2010. 2. K Avery, K Finegold, A Whitman. Affordable Care Act has led to historic, widespread increase in health insurance coverage. ASPE Issue Brief. US Dept of Health and Human Services. September 29, 2016. Available at: https://aspe.hhs.gov/sites/default/files/pdf/207946/ACAHistoricIncreaseCoverage.pdf. Accessed October 11, 2016. 3. Early release of selected estimates from the National Health Interview Survey, 2015. National Center for Health Statistics. Available at: http://www.cdc.gov/nchs/data/nhis/earlyrelease/earlyrelease201605_08.pdf. Accessed October 11, 2016. 4. Assistant Secretary for Preparedness and Response. National Health Security Strategy and Implementation Plan 2015–2018. US Dept of Health & Human Services. Pg. v. 2014. Available at: http://www.phe.gov/Preparedness/planning/authority/nhss/Documents/nhss-ip.pdf. Accessed October 11, 2016.